Andritz HQ-Press bark press increases the energy value of bark. Photo courtesy Andritz. 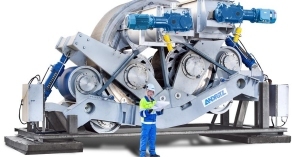 March 29, 2019 - Andritz announced that it will supply Ilim Group with a wood processing plant with two debarking and chipping lines, chip and bark handling equipment, and a SmartWoodyard advanced control system to Ilim's Koryazhma mill in the Arkhangelsk region, Russia. Start-up is scheduled for mid-2021. The new woodyard will replace existing woodroom and chip storage facilities, which have a pneumatic conveying system. Andritz scope of supply includes new debarking and chipping lines with: a unique de-icing process for logs in the debarking drums; horizontally fed HHQ-Chipper; two HQ-Press bark presses; chip and bark handling equipment, including chip storage; and SmartWoodyard advanced control system. Editor's Note: Ilim Group operates three pulp and paper mills and two modern corrugated box plants in Russia. The company's mills produce over 75% of all domestically produced market pulp, 20% of board, and 10% of paper — 2 million tons of pulp per year; 650,000 tons of board per year, and 480,000 tons of paper per year.